Olivia is a writer, narrative designer and editor, both freelance and at Failbetter Games. In 2017 she was selected by BAFTA as a Breakthrough Brit in the UK videogames industry. At Failbetter Games, her work includes supplying in-game content and ensuring a constant flow of writing, checking the design and continuity of stories, ensuring that work includes meaningful player choices, and maintaining the style and standard of written content. 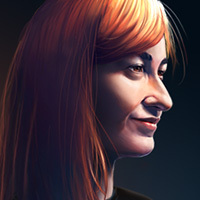 As a freelancer, she has consulted on narrative design as well as contributed writing to other narrative driven games.